Lovers of Rockabilly and Swing have a fantastic date for a long weekend in the new edition of Rockin Race Jamboree in Torremolinos. Days 7,8,9 and 10 February 2019. This year 2019 the event will take place on 7, 8, 9 and 10 February. There will be a pre-festival at the Hotel La Barracuda on February 6 with exclusive entrance for customers who have paid for the 5-day voucher. At the auditorium of Torremolinos will take place in February this great event of Rock from the 50’s and early 60’s, which is one of the most interesting events in the cultural winter calendar on the Costa del Sol. 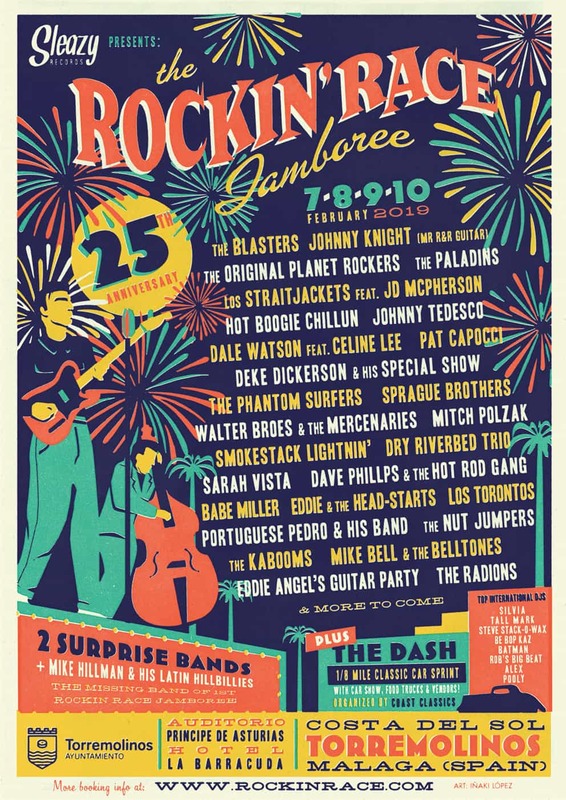 The Rockin’Race Jamboree celebrates this year a new edition, with many leading figures of the genre, being a must for thousands of lovers of this type of music from around the world. During the event there will also be a retro market of the 50’s with vinyl records, clothing and other accessories. Ready for a Rockabilly weekend in Torremolinos? The Costa del Sol town of Torremolinos as host of the event invites for its excellent weather at this time of year to enjoy the best Rockabilly under the Mediterranean sun. Torremolinos is also just 3 kilometres from Malaga Airport and has excellent infrastructure and hotels. Where is it celebrated and where to buy tickets? The price is 35€ per day plus one CD, if you prefer they sell a voucher to attend every day for 70€, which also entitles you to get access to the pre-party of February 6 in the hall of the Barracuda Hotel. There will be a big stage and a big dance floor. There will also be food, drinks and parking spaces. You will be able to use the wardrobe and the smoking area.